In 1303, King Edward I of England was in Scotland with his army. The monarch's expedition to conquer the Scots is believed to have brought him to a Highland castle which 710 years later has its own fan club and a chilling ghost story. Near the seaside town of Nairn are the impressive ruins of Rait Castle. The lands on which it stands were first held by Mackintosh clan chiefs in the 13th Century. The territory was later seized by the Cummings, a family led by Norman knights that built Rait Castle. The Cummings, who were also known by the name de Rait, were among Scottish supporters of Edward I. A prominent member of the family, Gervaise de Rait, attended a meeting of the Scottish Parliament with the king in Berwick in 1296. Seven years later, Edward was back in Scotland leading a campaign to conquer the Scots. He passed through Nairn en route to another castle, Lochindorb. Built on an island on a loch, Lochindorb was used by the king as a base. He hunted game in the nearby wooded hills while his troops launched raids against his enemies' strongholds in the Highlands. According to the Save Rait Castle group, Edward is likely to have stopped off at Rait on the way to Lochindorb to spend time with the Cummings. When Robert the Bruce became King of Scotland in 1306 the Mackintoshes, who had fought for Bruce at Bannockburn, sought to reclaim Rait Castle. But the Cummings, despite having been loyal to the Edward, the Hammer of the Scots, were allowed to stay on. This only added fuel to the flames of the feud between the castle's rival claimants. The dispute also lies behind Rait's ghost story which tells of the ruins being haunted by a young woman with no hands. In 1442, according to George Bain's 1923 book History of Nairnshire, the Cummings invited the Mackintoshes to Rait Castle for a lavish feast where they could set aside their differences. A daughter of the Cummings' clan chief and a young Mackintosh were also said to have been lovers at the time. But rather than seeking to resolve the feud peacefully, the Cummings plotted to murder their dinner guests. The Mackintoshes were tipped off about the scheme and went ahead with the meal with dirks hidden in their clothing. During a toast to the dead, the Cummings made to draw their swords and found themselves at the end of a bloody assault by the Mackintoshes. The Cummings' clan chief is said to have escaped to an upper chamber where he found his daughter. He suspected her of alerting the Mackintoshes and in a rage attacked her with his sword. He cut off her hands as she jumped from a window. The castle is believed to have been abandoned shortly afterwards and left to fall into a ruin haunted by the handless girl. Alastair Cunningham is among members of Save Rait Castle fascinated with the building's history and stories. "This is a seriously old and interesting building, uniquely surviving for 700 years," said Mr Cunningham. He added: "The builder was Gervaise de Rait who was Edward I's man in Nairnshire. "Edward stayed at Lochindorb for three weeks in 1303 during which time the castles at Nairn and Urquhart were destroyed. It would be odd if he never visited his loyal henchman Gervaise de Rait." 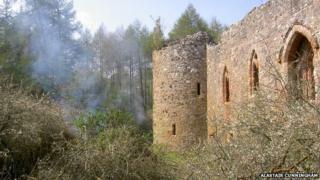 Volunteers and the owners of the castle, the Cawdor family, cleared weeds and other vegetation from around Rait in 2010. Mr Cunningham said by cutting away more bushes in the future the castle's ruined outbuildings, which include a chapel, might be revealed. The Cawdor family has owned Rait since 1532. A family spokesman said: "It has been described as the best surviving example of its type, a Scottish hall castle, and is unusual for having gothic windows with red sandstone mullions (divisions between units of a window). "The owners believe it is important that the castle is conserved in its undisturbed state and most recently undertook a major vegetation clearance of the site in consultation with Historic Scotland, and continue to maintain the site for its long term preservation." He added: "The owners do not seek to exploit it as a tourist attraction, but maintain periodic contact with Historic Scotland which is not currently requiring the owners to undertake any work at the present time."